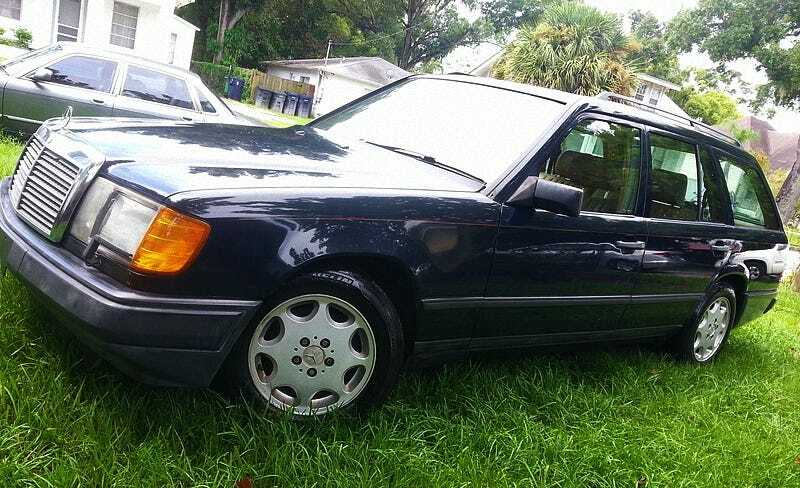 How About A 1987 Mercedes 300TD And A Parts Car For $3,200? Yesterday’s 2001 Lexus IS300 was sort of a package deal. I mean, it was an LS3 and an IS packaged together. Unfortunately, instead of two for one, it proved to many to be too much for the one, and that pony-packing custom ended up with a huge 78% Crack Pipe loss. There is much debate in the world of used Mercedes’ as to which is the more desirable car to own and drive - the W123 or its successor, the W124. There is no debate that the later car is far more technologically advanced, what with its multilink rear suspension, unexpectedly aerodynamic body, and fabulous articulating single windscreen wiper. They were also really well put together. I was just at my local Pick-Your-Part this past Sunday and while there I marveled at the W124s that had the sad misfortune of ending up there. Most still had parts - seats, dashboards, etc - that looked like almost they were new. Of course the bashed in nose or crushed roof that was the likely cause of their demise did detract from the image a bit. Here we have a driver W124, a rare-ish 1987 300TD with an OM603 SOHC six cylinder turbo diesel. That means 143-bhp and 187 lb-ft of torque to move the Estate’s 3,230 pounds with dignity if not alacrity. Now, the early 603s suffered some teething problems. The aluminum heads were prone to heat-related cracking and warping exacerbated by the particulate traps fitted to the U.S. cars. The seller says this one runs awesome, and comes with just 135,000 under its belt. A dealer should be able to discern if it’s been retrofitted by Benz to address the issues. Behind that oil burner will be Mercedes’ stalwart four-speed automatic, and it is RWD only as the TDs didn’t come in 4-matic form here. W124 interiors are typically proud representations of German design quality and construction, and this one seems to hold up the mantle. It comes with what looks like sturdy MB-Tex upholstery and three rows of seating options. The beige is strong with this one, and overall, aside from some dash cracking and normal sun fading (oh and sagging scrotes setback netting) it looks a decent enough place to be. The bodywork on the other hand looks to be good from far, but far from good. Most notably there is rust in both the sunroof frame and on the driver’s side A-pillar. Props to the seller for noting these in the ad. There are also some dings here and there, and a cracked headlight trim, but none of that should make you want to walk away from the car, especially when you get a whole other car along with it! The 300TE that is part of this package deal is an ’88 and it comes with a title too in case you want to elevate it from ‘parts car’ to ‘car’ status. It is claimed to be little more than a fuel pump away from that option. The paint on the TE is pretty bad, the clear coat having packed up and left for parts unknown, but the body seems sound. It does have some broken trim pieces and a general hobo-ness about it, but the interior looks to be in excellent shape. The final bit of this package deal is a W124 diesel fender with the slotted intake vents. I don’t know if that pushes your buttons, but if it does, then fold down the seats in the runner and slid it on in. The package price for this Benzagasm is $3,200 and should you have the room, it seems like there’s a lot more than that in just parts here. Of course, there’s the rust on the driver, the fuel pump on the gas car, and the lack of the rest of the car on the fender with which to contend. That all may color your ardor for paying so much. What do you think about this package deal? Is $3,200 a good price for so much Mercedes? Or, is this a package you’d return to sender?